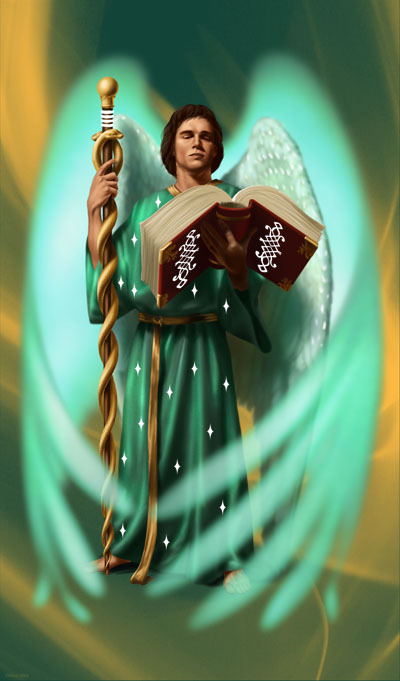 As Raphael is said to be the ruling angel of the planet Venus I thought it would be a good idea to choose this Archangel to talk about during the Zodiac sign of Libra. He is closely associated with the energy of universal love and healing, and has become the one angel to whom many of us turn for all levels of healing – from personal to planetary. One of the magnificent seven Archangels of the Presence of God – and well known as one of the four Archangels of the directions who watch over the whole of creation. The most well known symbol of Raphael is a caduceus which is a staff entwined by two snakes, and this is still used as a traditional symbol in medicinal sciences. Raphael is also closely linked to the science behind all the healing arts and his service to humanity is to lead the medical professions and other healers by radiating his powerful loving light through them. All names carry a vibration which we human beings need to intellectualise and turn into meaning. If we consider just for a moment what Raphael means “God has healed” we can see that the vibration of healing from this wonderful archangel energy is instant. It doesn’t mean God will heal , but God has healed . We ask for healing, we bathe in the energy of the name in our meditation – have faith – and we are made whole. Just like the Biblical miracles where Jesus the Master of healing told people that their faith had healed them. For some of us that is a huge leap isn’t it? Our imperfections and our ailments have become part of our story.To become whole, or healed, needs a completely new script. Many of us have to contend with physical, emotional or psychological pain at some time in the course of our life. Working with the powerful God-force of this angel can help by attracting and channelling healing energy through our being. Raphael can also bring relief from stress and anxiety. Working on many levels, both physical and psychological he is able to help a persistent pain to lessen or disappear, or enable us to see an emotional problem in a clearer light. Visualise Raphael’s green light enfolding you. Ask him to grace you with the energies of healing with this affirmation: “Raphael, I am transformed and healed as I recognise my connection with the Divine”. As we know, like attracts like. To bring more of something we need to give it out as much as we can as well as be ready and willing to accept. This Universal Law applies to everything, but especially money, friendship and love. To attract more love into our life or a loving relationship when we feel ready, we must first open our own heart fully, (not close it down in an effort to protect ourselves, no matter how much we feel we have been hurt in the past) and send out bucket loads of love to others. A lovely exercise I teach for doing this was inspired by an Indian story called ‘Indra’s net’ and all you have to do is to imagine a beautiful sparkling net in the sky. Where ever there is a crossed strand it is knotted with a bright sparking gemstone, just like a fishing net strung with a thousand jewels. This is especially easy on a brightly lit Autumn night when the sky is full of twinkling stars – particularly if you are fortunate enough to be away from a city where there is very little light pollution. Take a seat, or even better lie down on the ground and take some deep breaths, imagining this beautiful spangling net, … imagine throwing it out into the Universe with all your love, from your heart. Now imagine that by all of those shining stars, or gemstones stands a beautiful angel sending out light and love. Now imagine yourself as one of them, beaming your own love and light all over the world. As you shine your love it is reflected back to you by all the others. Allow yourself to feel that loving energy and then bring yourself back into your own space and reality, drawing in the net towards you along with all the loving energy that you need. The more you ‘cast your net’ of love and sparking energy around you, the more the Universe recognises your readiness to give and receive unconditional love in your own personal life. Enjoy.